In an attempt to go further with the media monitor analysis, I will change the rhythm to a quarterly review schedule, in addition to Special Editions whenever a major event has occurred like the latest GDC one. Now, because I haven’t done an analysis for December 2014, you will get a 4 months special Quarterly review. We talked about it extensively, in December, Sony played a master move with the Playstation Experience. This is very apparent in the month data, with the Playstation brand getting more than 80% more mentions than the Xbox one. It pushed December above June as the best month for media awareness for Sony, despite the incredible coverage that E3 is getting. Grand Theft Auto lead the charge, fresh off a November release on the PS4 and Xbox One, and the upcoming PC version in early 2015. It is interesting and unusual to see The Crew, a game with a lower profile than many of the others in the above ranking. 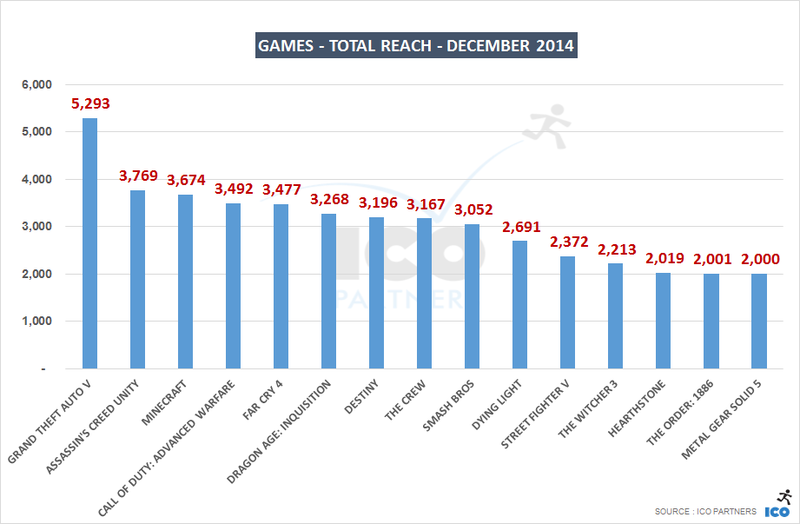 The early December release may have helped, it is the only listed game that released that month. Finally, last note on my part, is the excellent performance of Hearthstone. The Goblins vs. Gnomes set was the first significant beat that month, followed by the release of the Android version, that also received extensive coverage (about 280 articles just on this). January is usually a quiet month announcement-wise. 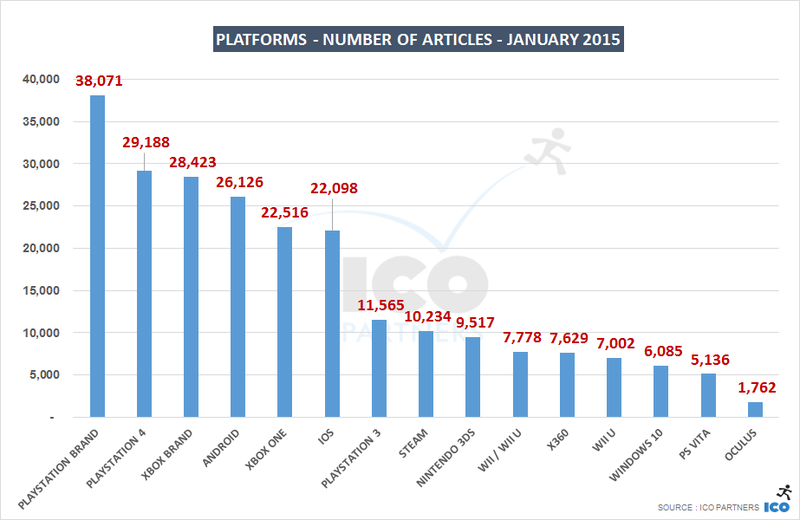 The most significant growth in media mentions for a platform is Windows 10. It shows Microsoft ramped up its effort with the new year, mostly it’s coverage on the preview event from January 21st. 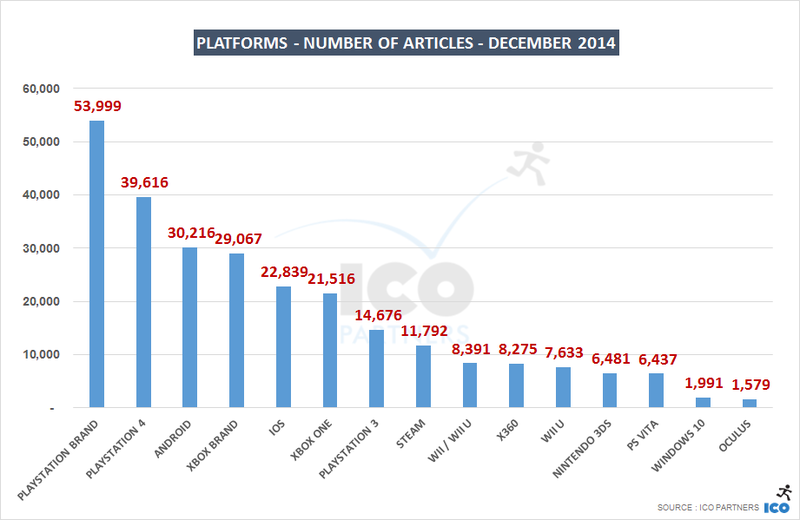 Interestingly, Oculus had a stronger-than-usual media presence thanks to Microsoft too. The Hololens announcement generated a lot of articles mentioning the Oculus device as a comparison and/or reference to the Augmented Reality/Virtual Reality arms race. Dying Light was released end of January, getting the new release spotlight for itself. Similarly to the previous month though, most of the most mentioned games are actually not out during that month, January being relatively quiet releases-wise. 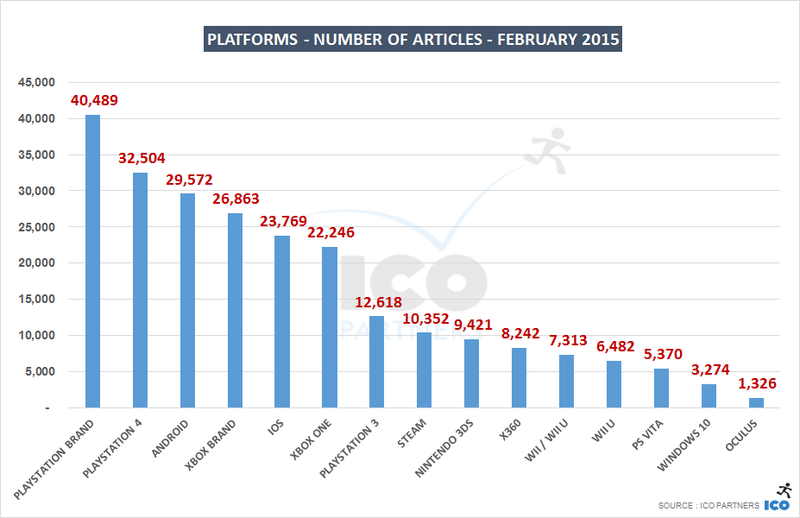 It is interesting also that it is probably the month that has the widest “spread” of news. From our usual top 15 games, we rarely see games with fewer than 2,000 mentions in the month. For example, League of Legends’ 1,751 articles is actually a pretty regular performance for the game (even if it was a good month with a few nice news items, including the release of music tracks related to the game), and not something particularly exceptional. February saw similar numbers to January. Windows 10 dropped off, but not dramatically, entering an ongoing phase of promotion from Microsoft. 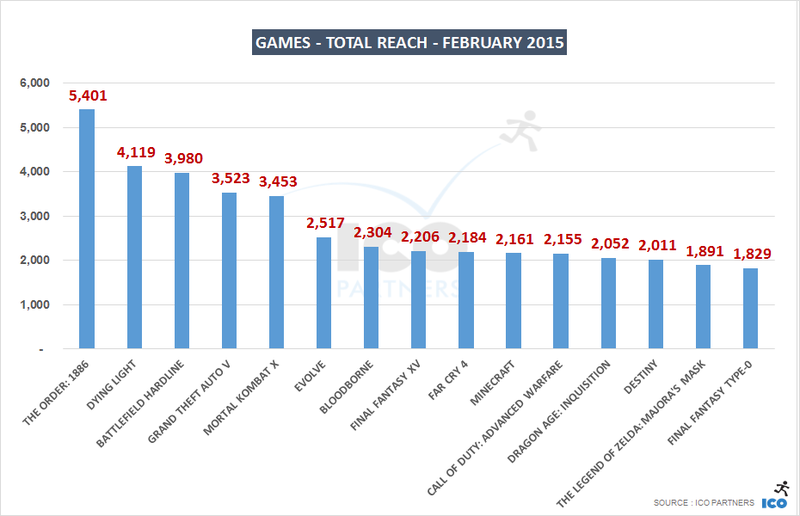 The Order: 1886, released that month, topped the ranks. It is very hard to measure how much the controversy around the lifespan of the game helped those numbers. In the past, when looking at controversies, it seemed they didn’t add that much volume though. 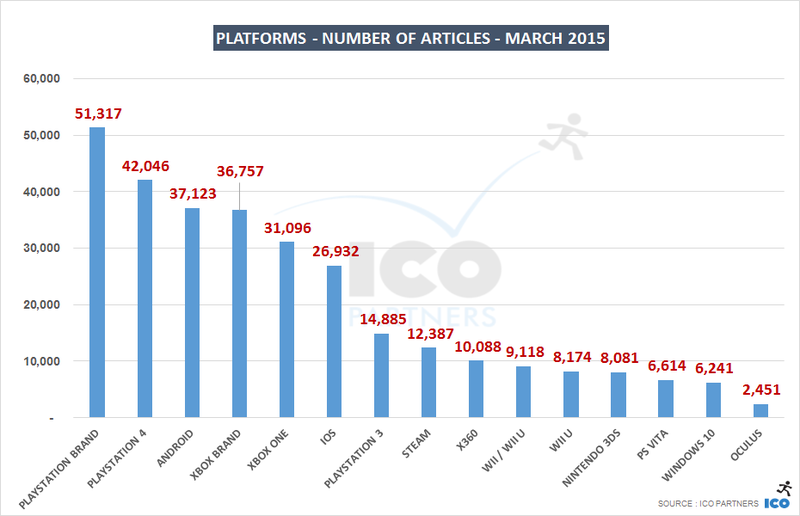 Dying Light being released at the end of the previous month pushed it further into February’s media presence. And while Battlefield Hardline’s strong performance was a ramp up towards its March release, it is also notable that Mortal Kombat X picked up up nicely while its release wouldn’t be until mid-April. March was GDC. So a lot of the extra media coverage came from the news around the event and I would encourage you to read the article written on this. Android’s strong presence is coming from the MWC in Barcelona, with its numerous Android-related announcements. The nVidia New Shield micro console reveal at GDC also helped a little bit. Microsoft was also quite aggressive with its Windows 10 announcements during GDC, supporting its strong media presence. 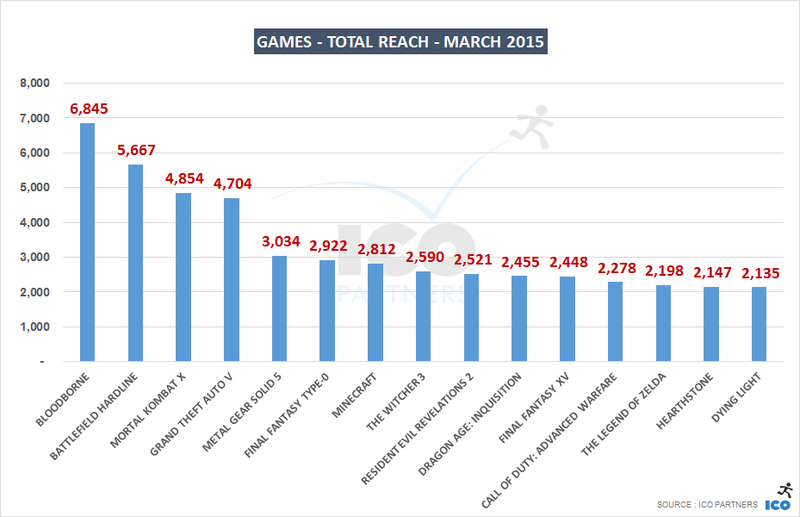 March saw a similar trend as in February, but with Bloodborne taking the top spot. The game’s excellent critical reception explains the sudden burst of media coverage, beating Battlefield Hardline despite being a new brand. 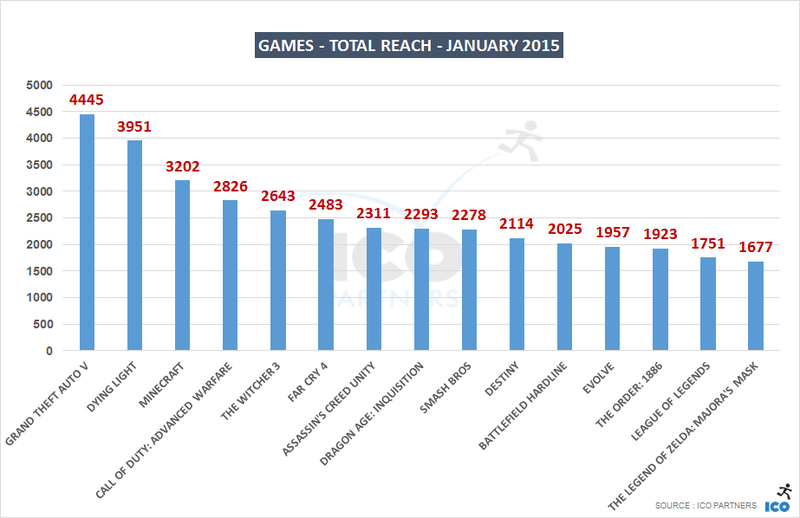 The Witcher 3 edges closer to release and re-appreared in the top 15, roughly at the same level as in January. Hearthstone, as in December, had its upcoming expansion to thank for entering the top ranks. As I move towards quarterly reviews, I will try to use the free time to get more case studies and carry out analysis of specific events. On my list at the moment, the Deus Ex: Mankind Divided announcement and Goat Simulator. Let me know if you have specific games whose media presence you would like me to break down. Methodology reminder: For more details on the methodology and the way the tool we are using is working, check the dedicated blog post.